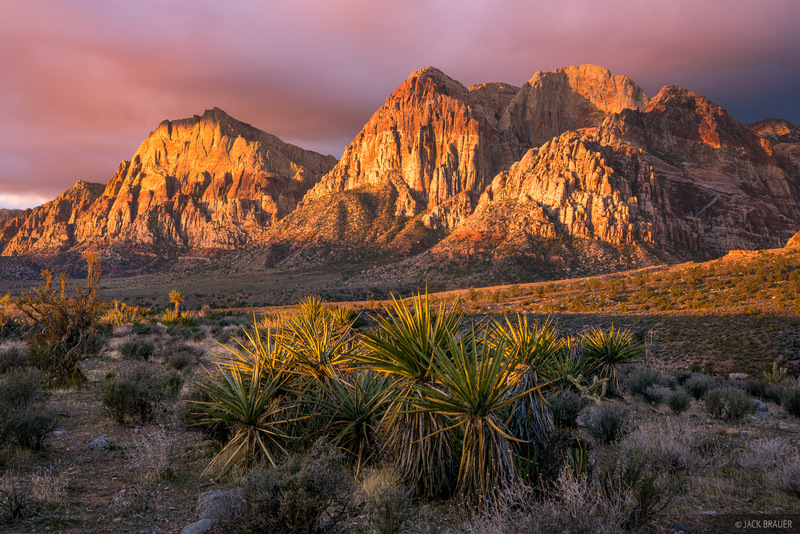 Awesome sunrise light on the sandstone mountains at Red Rock Canyon near Las Vegas. 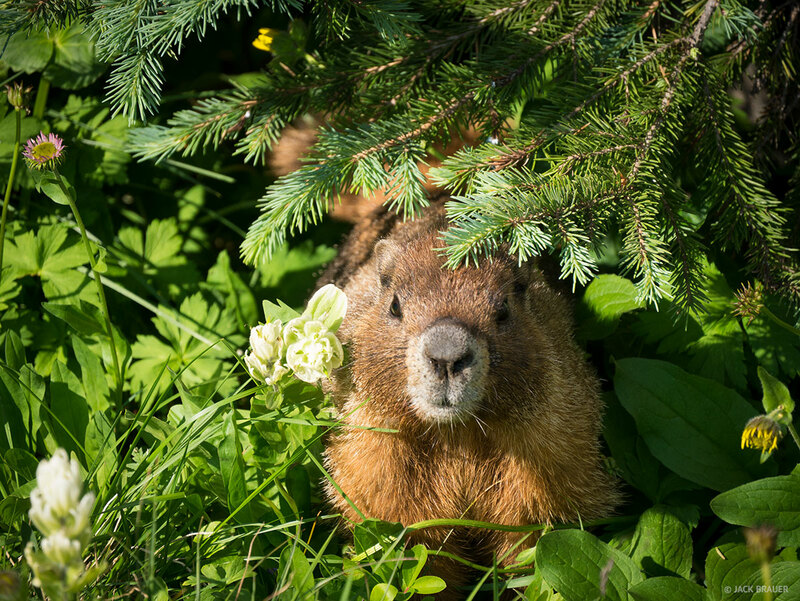 Posted in Deserts & Canyons and tagged Nevada on March 31, 2018 by Jack Brauer. 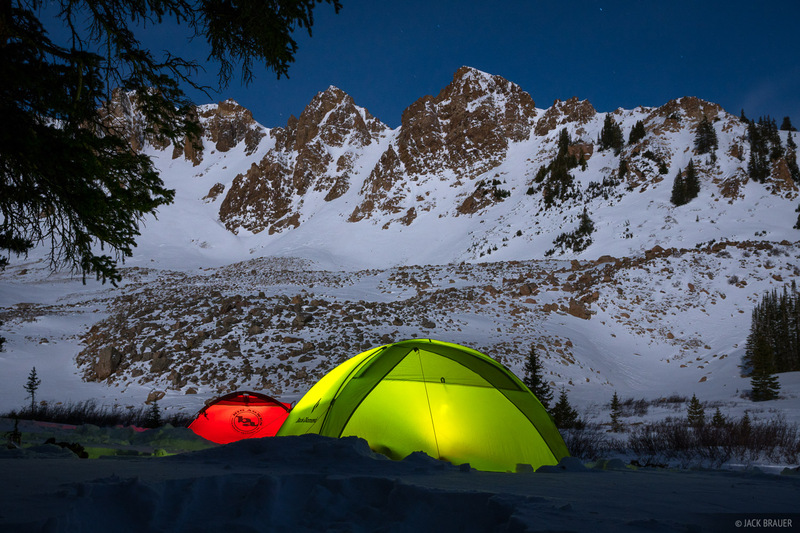 Winter camp below Little Italian Pass in the Elk Mountains, Colorado – January. On the last morning of January there was a lunar eclipse over much of western North America; here in Colorado the eclipse happened right at moonset, just before dawn and sunrise. This was a perfect scenario for us photographers, since photographing the eclipsed moon near the horizon is far more interesting than when it’s high in the sky. With this rare celestial lineup I had an ambitious plan to hike up to a 13,000-ft ridge to hopefully shoot the eclipse right behind Castle Peak in the Elk Mountains. My friend Ann Driggers joined me and we backpacked into the mountains and set up a base camp in the snow at 11,600 ft. At 2:30 in the morning we woke up and hiked in the moonlight up a pass and along a long windswept ridge to 13,000 feet, only to have our hopes dashed by a thick layer of clouds blocking any potential for the dream shot I had in mind. Not only that but the brutal wind grew worse with sideways blowing snow, so we had little choice but to retreat and navigate back down via GPS. Of course I was sorely disappointed to miss this rare photo opportunity that I had envisioned, but at least we put in a valiant effort! Posted in Backpacking & Trekking, Colorado and tagged Colorado, Elk Mountains on February 1, 2018 by Jack Brauer. New Year’s Eve torch ski parade and fireworks at Mount Crested Butte, Colorado – December 31, 2017. Happy New Year from Crested Butte, Colorado! My wife tells me of a German tradition that the first 12 nights of dreams in the new year signify omens for the next 12 months. Well, last night my first dream of 2018 was of a new invention called “Feetza” — which was pizza shaped like a foot. Needless to say, I think my January is going to be brilliant! Posted in Colorado on January 1, 2018 January 1, 2018 by Jack Brauer. 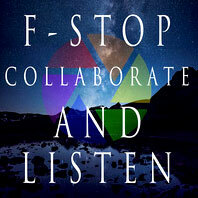 Recently I was interviewed by fellow Colorado photographer Matt Payne, on his podcast “F-Stop Collaborate and Listen”. You can look up the podcast in your favorite podcast app, or listen to it here. I was happy that Matt invited me to participate on his podcast, since it’s one of my favorite podcasts that I listen to regularly. The podcast is devoted to landscape and nature photography, and I love the casual interview format of each episode. I’ve been binge listing in recent months; there’s almost 3 dozen episodes up already featuring a wide variety of talented and insightful photographers. (Matt himself is a very talented and insightful photographer too!) Many of his guests are very well spoken; me – not so much! But I hope you enjoy it anyways. 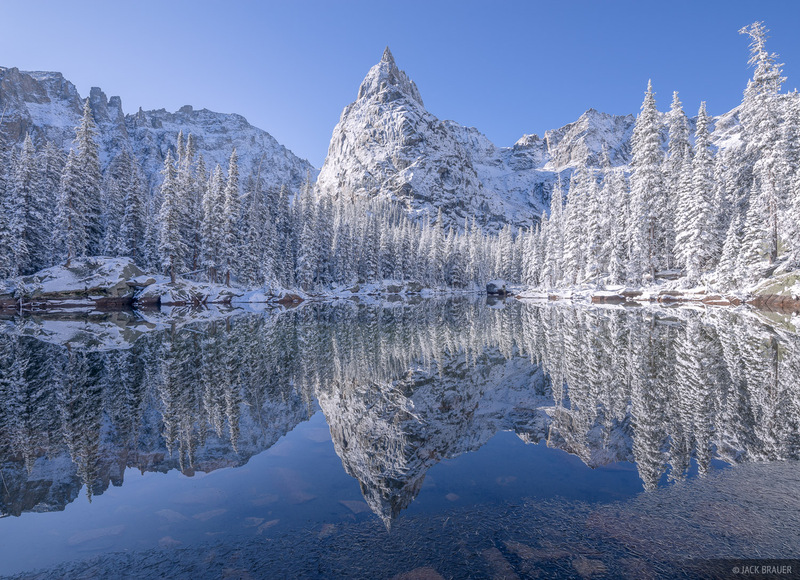 Posted in Publication and tagged Colorado on December 27, 2017 December 27, 2017 by Jack Brauer. Ancient Puebloan pictographs from around 1,000-1,300 AD. It’s hard to see in this photo, but underneath these pictographs are older reddish figures dating from 1,000-3,000 BC! In early November a friend and I backpacked about 30 miles through Salt Creek and the Peakaboo Trail in the Needles District of Canyonlands National Park, Utah. 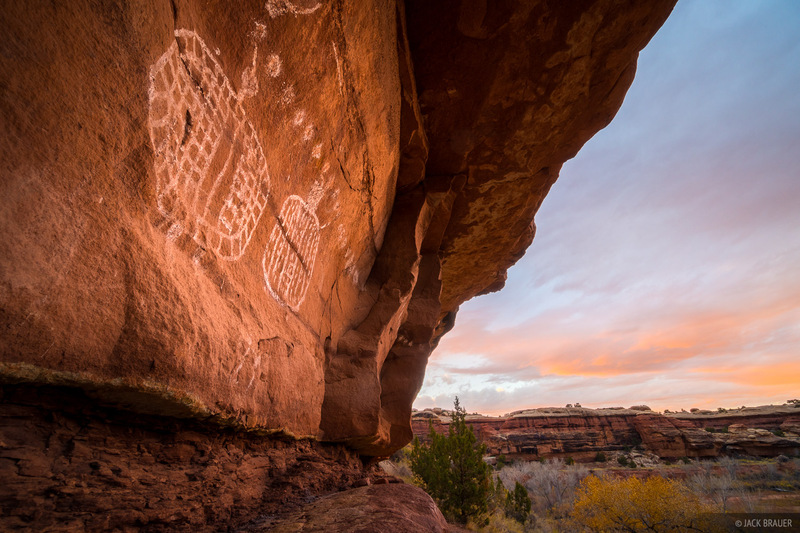 This canyon is renowned for its numerous Ancient Puebloan ruins and pictographs; in fact I’ve never seen so many ruins outside of the Cedar Mesa area! 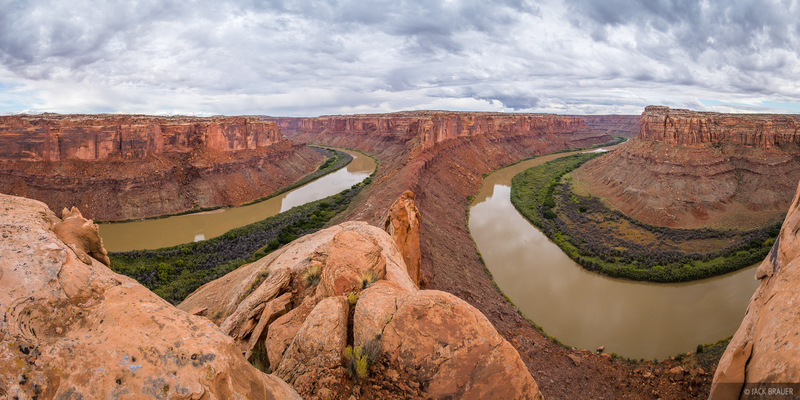 Posted in Backpacking & Trekking, Deserts & Canyons and tagged Canyonlands, Utah on November 8, 2017 January 4, 2018 by Jack Brauer. 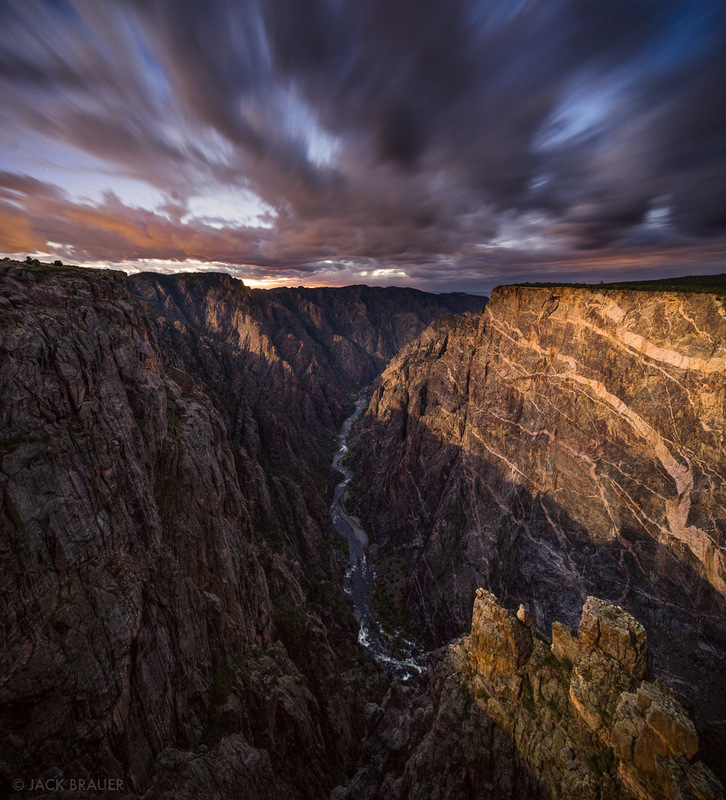 Post-sunset glow on the walls of the Black Canyon, Colorado, as seen from the bottom of the Warner Route. 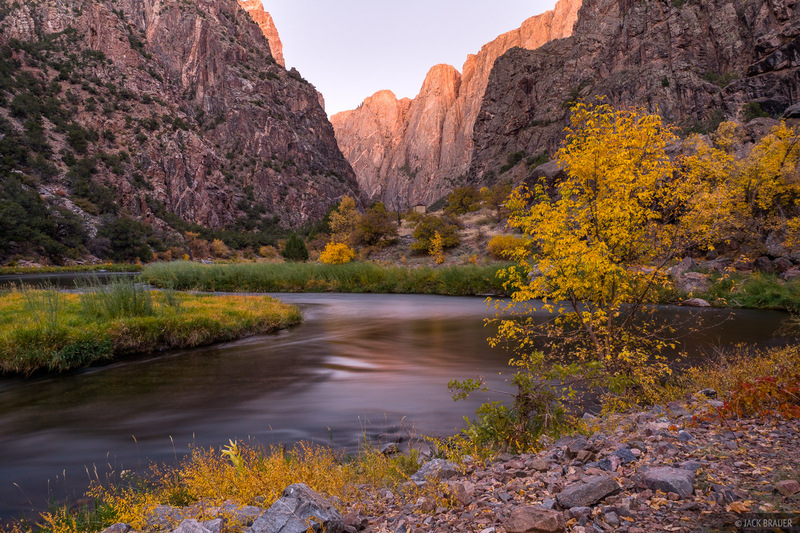 In late October my buddy Kevin and I hiked down the Warner Route and camped along the Gunnison River at the bottom of the Black Canyon for a night. We brought our fishing rods for the “gold metal” water, and it did not disappoint! We caught a bunch of brown trout and kept a few for dinner. Delicious! 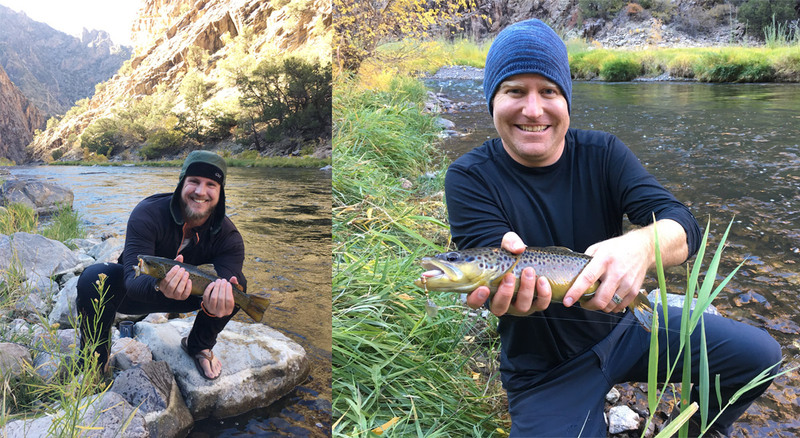 I floated and fished the lower Gunnison Gorge with my dad a couple times back in 2007 and 2008; you can see those photos here. And lots more Black Canyon photos here. Posted in Backpacking & Trekking, Colorado and tagged Black Canyon, Colorado on October 25, 2017 January 4, 2018 by Jack Brauer. For all of August and September 2017, my wife and I lived out of our truck and tent while traveling around and backpacking in our great state of Colorado. We did over a dozen backpacking trips in various mountain ranges throughout the state, including the Flat Tops, Gore Range, Sawatch Range, San Juans, Sangre de Cristos, and Indian Peaks. I’ve posted my various photo journals from each trek on the Trip Reports page of my gallery site; here links to all those journals, in chronological order. You can also see a gallery of all my favorite photos from the 2 months here! 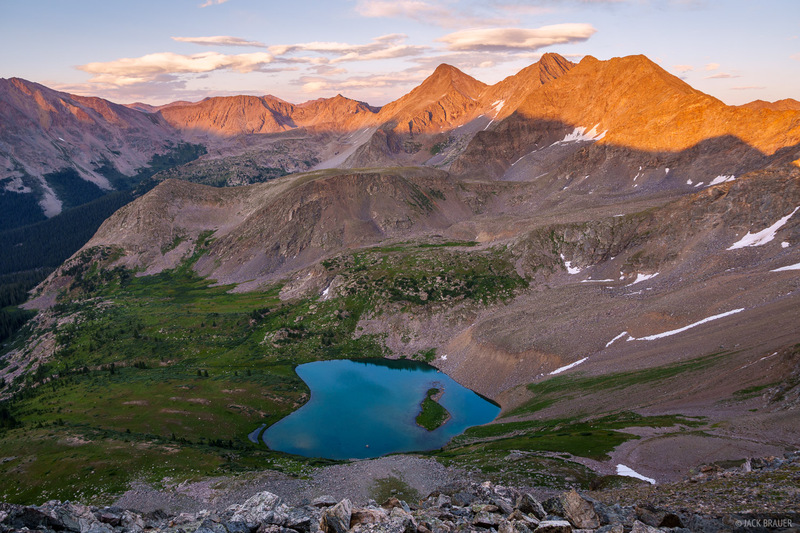 In early August we backpacked into the rugged north end of the Gore Range and Eagles Nest Wilderness for three nights. We hiked the Upper Piney River Trail for while, branched off on a faint boot trail then camped the first night in the high basin below Mount Powell and Kneeknocker Pass. On day two we crossed over the pass and hiked to the summit of Mount Powell, the highest peak in the Gore Range. I’ve wanted to hike Mount Powell for about 20 years but never got around to it, so it was quite satisfying to finally stand on the summit! After some rough off trail routefinding we spent the next two nights at a remote alpine lake before hiking all the way back out the way we came. 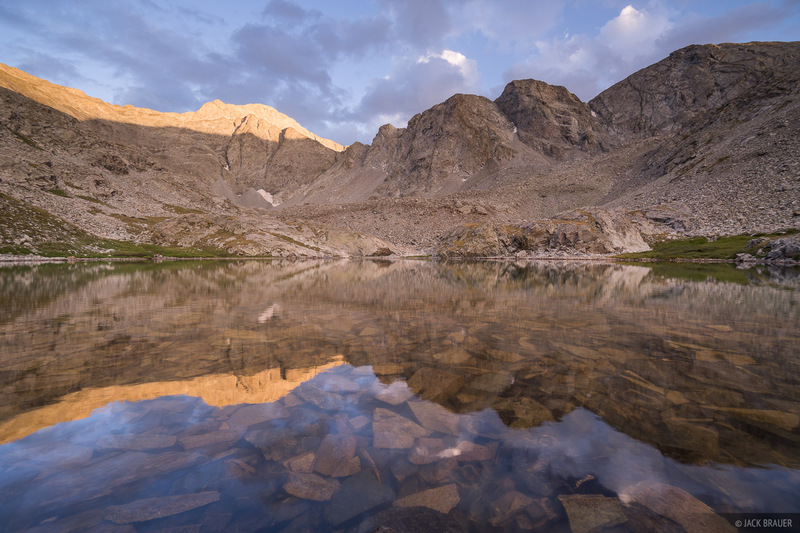 After our backpack trip in the northern Gore Range, we drove over to the east side and backpacked into the Eagles Nest Wilderness again, this time to Willow Lakes. I’d backpacked here 12 years ago and I was excited to show Claudia this place and hopefully to photographic some nice light too! We spent a couple nights up there, generally relaxing and exploring this beautiful basin. 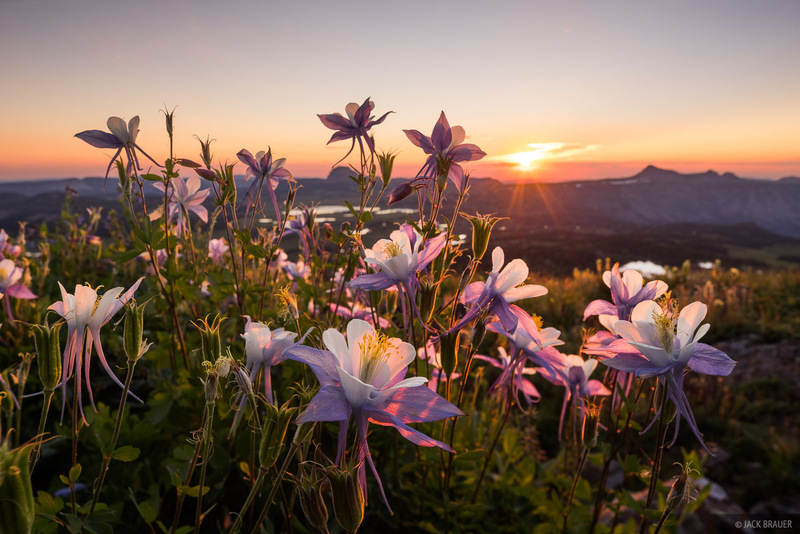 I was fortunate to photograph some of the best sunrise light of the summer here! 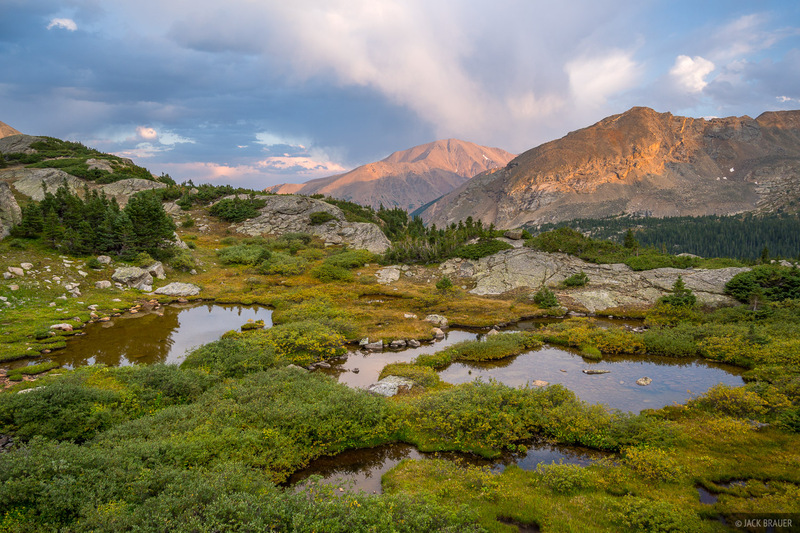 In early August we set out into the Holy Cross Wilderness (in the Sawatch Range of Colorado generally between Vail and Leadville) for a 3-night backpack trek. We spent our first night at the super popular Missouri Lakes then explored an off trail route over a high ridgeline to a remote and pristine lake where we spent the second day and night. We spent our third night near Blodgett Lake before hiking back via Fancy Pass and Holy Cross City, completing an irregular loop through this beautiful wilderness area. In mid-August we backpacked around the headwaters of the South Fork Clear Creek near Huron Peak in the Collegiate Peaks Wilderness and Sawatch Range of Colorado. The last time I hiked in this area was back in 2008, but this time we hiked the long way in here from the south from Taylor Park and Texas Creek, via the Continental Divide Trail and a high pass above Lake Ann. Though we spent three days out here, most of my photos below were from one fantastic evening watching sunset atop an unnamed peak above Lake Ann. After spending my birthday with some friends in Ouray, we drove up some of the jeep roads above Red Mountain Pass and car camped a few nights up there. We drove rough high elevation old mining roads eastward through the San Juans over Corkscrew Pass, Hurricane Pass, California Pass, and Cinnamon Pass, then did a one night backpack trip into Cataract Gulch near the 14er Sunshine Peak. 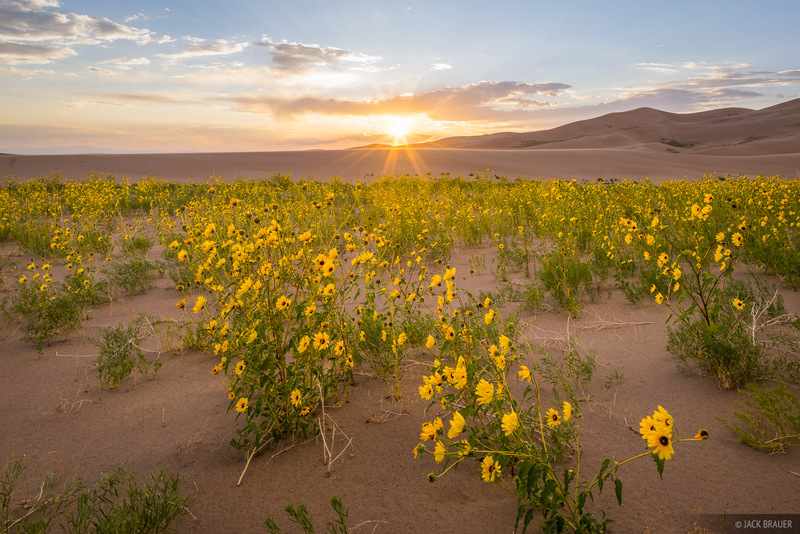 While hiking to South Zapata Lake the day before, we got a good view of the Great Sand Dunes, and I could see vast fields of sunflowers all around and in the dunes. I took a mental note of where the largest sunflower fields were and the next day we hiked into the dunes towards these areas. Though we intended to camp in the dunes for the night, enormous thunderclouds rolled in and scared us out of there! Fortunately I was able to photograph the sunflowers without getting struck by lightning! 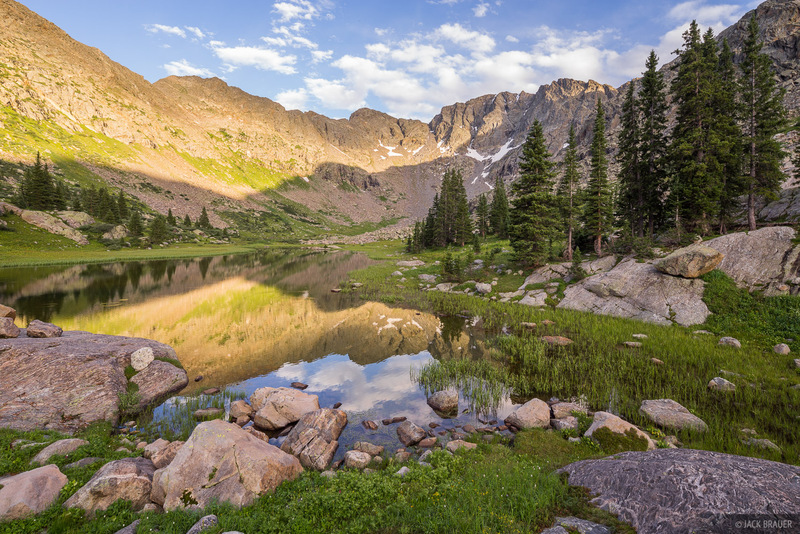 In late August/early September, we spent five days camped at South Colony Lakes in the Sangre de Cristo range in Colorado. 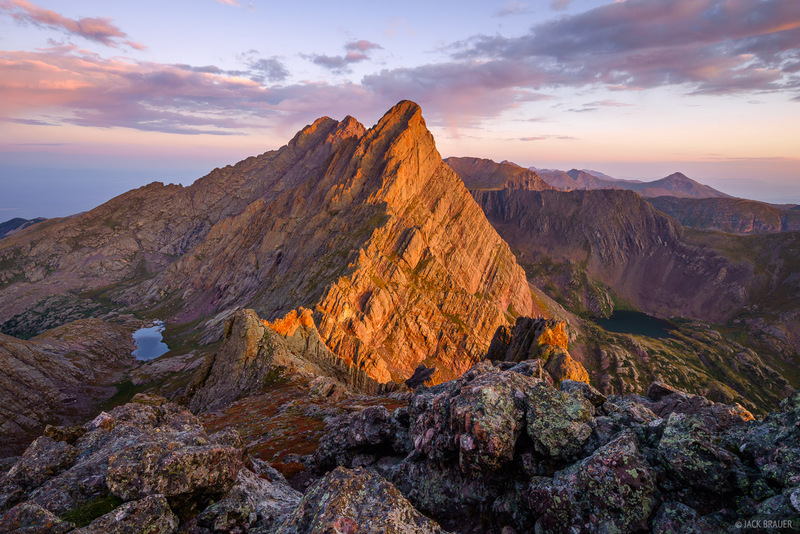 Surrounded by three 14ers, including the rugged Crestone Needle towering directly overhead, this basin is supremely awesome — one of the classic gems of Colorado. 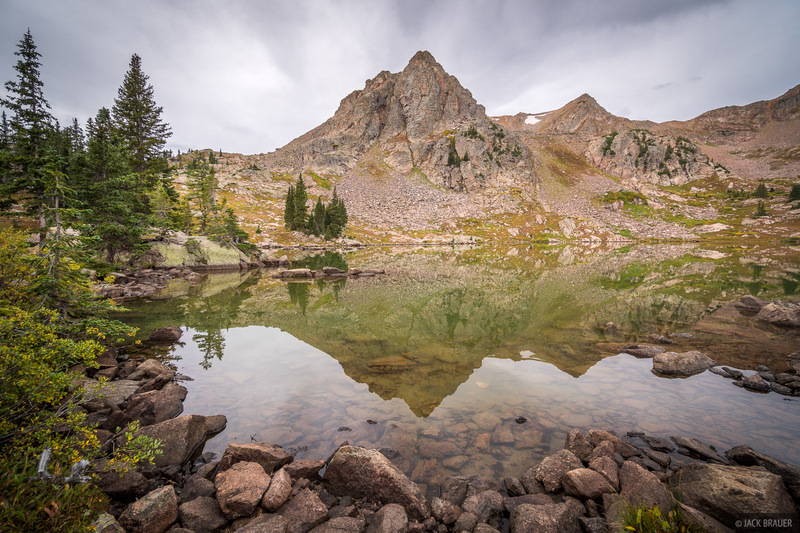 During our stay here we summited Crestone Needle and Humboldt Peak, along with lots of chilling out around the lake in between. In early September we spent a night up at North Halfmoon Lakes below Mount Massive. Though our plans to hike the peak were thwarted by high winds and hazy skies from the wildfires in the northwestern US, we still enjoyed an evening and morning at the lake. In mid September we returned to the Gore Range again, this time spending a night at the beautiful Gore Lake towards the south end of the range. From the Gore Range we drove further north to Indian Peaks, were we backpacked to a remote and beautiful basin where we spent two nights. 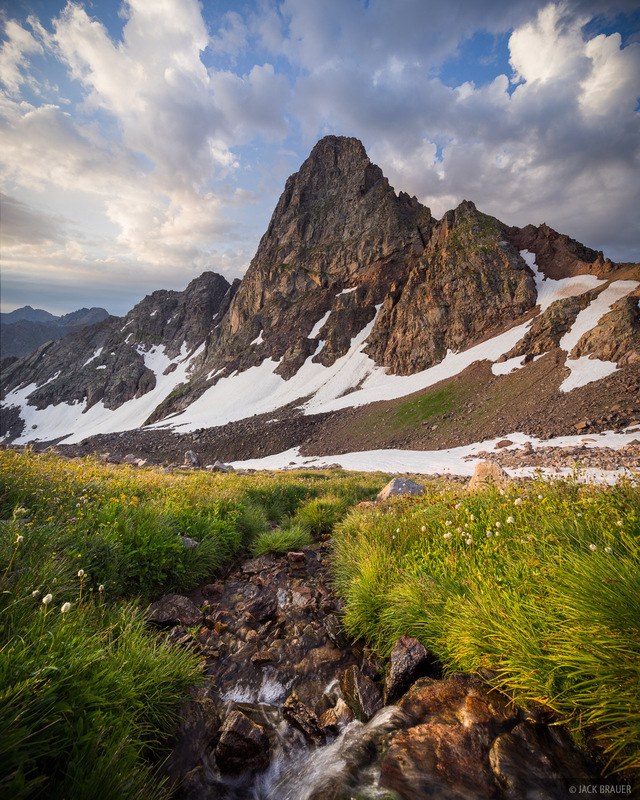 Indian Peaks was where I did most of my first backpacking trips back in my college days at CU Boulder, and I quickly became a backpacking fanatic after that! It’s been over a decade since I’ve returned, and it felt like seeing an old friend again. After our backpacking trip in Indian Peaks it was about time for a rest, so we spent a few nights camping at the Moraine Park campground in Rocky Mountain National Park. 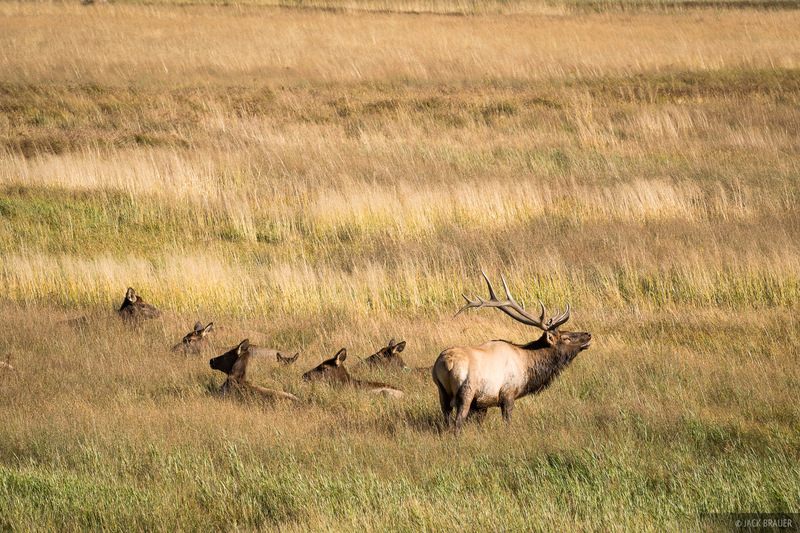 I must say it was quite magical to fall asleep each night listening to the elk bugling in the big meadow below us during their autumn rut. 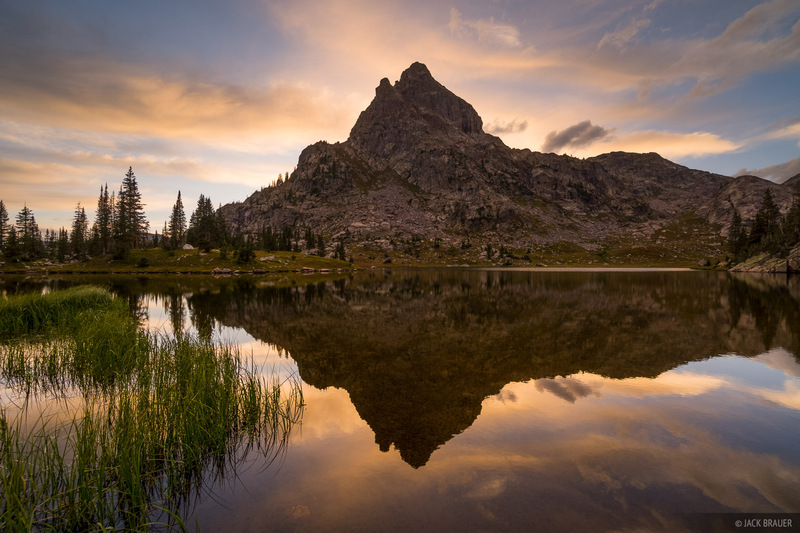 In late September with a forecast for a quick but powerful autumn snowstorm, we returned to Indian Peaks to one of my favorite spots – Mirror Lake and its incredible view of Lone Eagle Peak. After spending the night in an intense blizzard we awoke to bluebird skies and a glorious snow-smothered scene. This was our final backpacking trip of our two months on the road in Colorado, and it was fitting that my favorite photo of the whole trip came that morning! After some our snowy backpacking trip in Indian Peaks, Claudia had had enough of the cold, so we escaped to the desert of Utah for dry land and warmer weather. We spent a couple nights relaxing and hiking at one of our favorite spots on a remote plateau high above the Green River, then spent a night at Swaseys Beach just north of the town of Green River. This was a relaxing end to our two months on the road! On the way back home from Utah we spent one last night camping at the South Rim of the Black Canyon. The next day we drove back to Crested Butte and started moving back into our condo, and our big summer trip was official over. Posted in Backpacking & Trekking, Colorado and tagged Colorado, Flat Tops, Gore Range, Indian Peaks, Rocky Mountain National Park, San Juans, Sangre de Cristos, Sawatch Range on September 30, 2017 January 4, 2018 by Jack Brauer. Just a quick update for those of you who follow my blog and haven’t seen a new post in over a month! At the end of July after our travels in Germany and Austria, we returned to Colorado and have been on the road here ever since, living out of our truck and doing back-to-back backpacking trips pretty much the entire time. So far we’ve backpacked in the Flat Tops, twice in the Gore Range, thrice in the Sawatch Range, and twice in the Sangres. 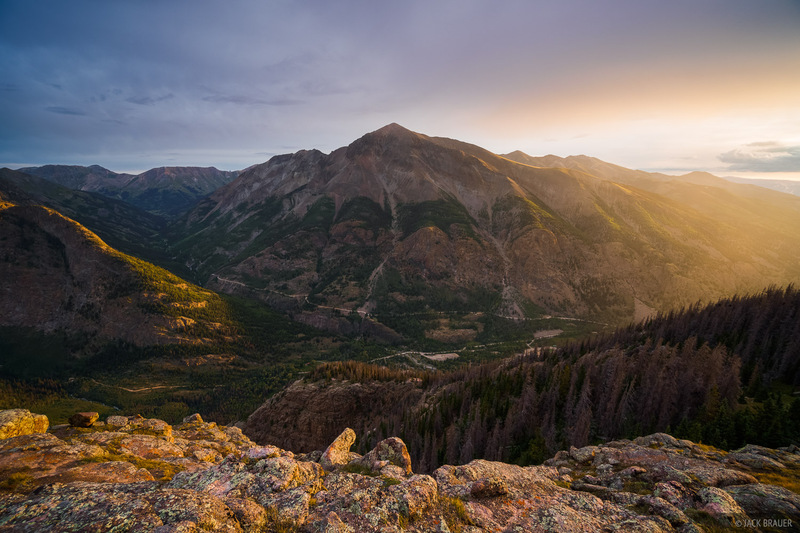 Basically my goal this summer is to re-visit all these other mountain ranges in Colorado that I’ve neglected for the last decade or so while living in the San Juans and Elks. 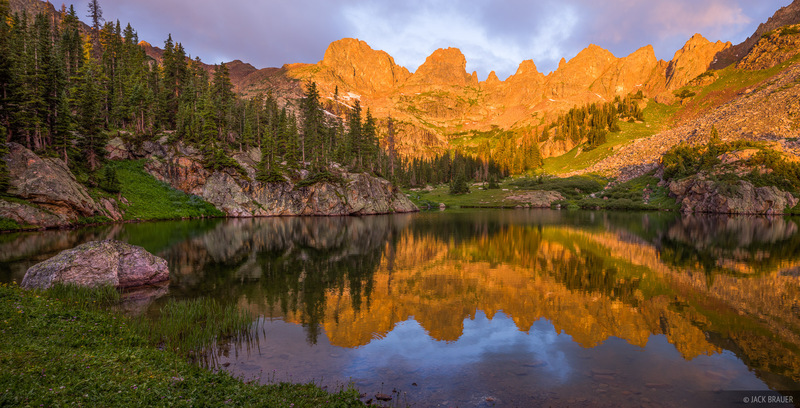 For the remainder of September we plan to spend more time in the Gores, as well as Indian Peaks and Rocky Mountain National Park. 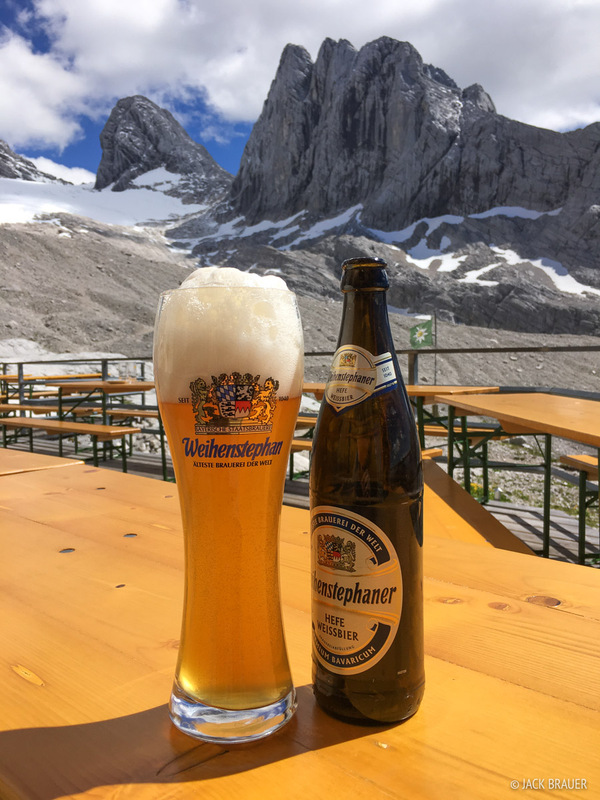 Suffice it to say, after three weeks of hut-trekking in the Alps and two months of backpacking in the Colorado Rockies, I have a truckload of new photos to share! Once we’re back settled into our place in Crested Butte in October, I’ll start rolling out the photos and trip reports from all of our summer adventures. Stay tuned! 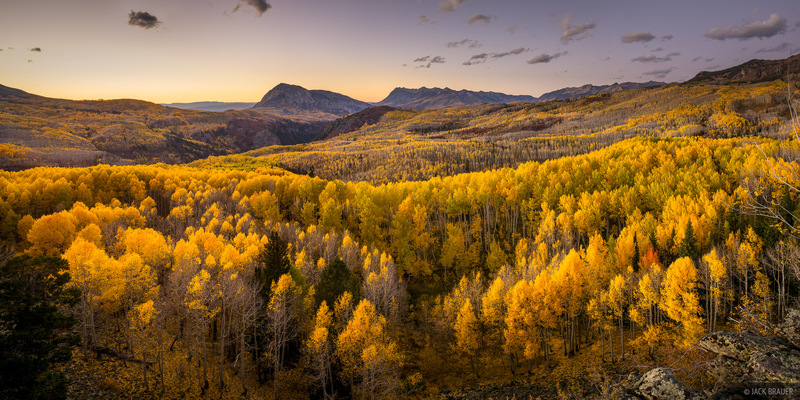 Posted in Colorado and tagged Colorado on September 9, 2017 by Jack Brauer.